An erudite survey of the evolution and distinctiveness of Jewish humor. Dauber (Yiddish Language, Literature, and Culture/Columbia Univ. ; The Worlds of Sholem Aleichem: The Remarkable Life and Afterlife of the Man Who Created Tevye, 2013, etc.) 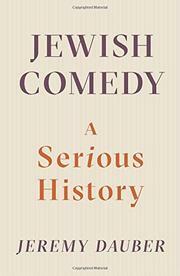 offers a thorough, authoritative examination of Jewish comedy “in all its vast and variegated forms, from antiquity to yesterday,” which is the subject of a course he has taught for the last 15 years. Although sprinkled with jokes, the book is not a compendium but instead a history of Jewish culture, theology, and literature focused on the function of satire, irony, and wit in Jewish life. The author begins by locating humor in the Talmud, Torah, and Old Testament. The Bible, he admits, “is actually Not Funny.” Nevertheless, he finds much evidence of biblical wit, parody, and laughter, citing, for example, Esther, Solomon, and Job. He notes Sarah’s laughter when she is told that she will bear a son with her aged husband, Abraham. “Her laugh,” Dauber writes, “is a laugh of irony: Sarah knows the way the world works, and she’s mocking her foolish husband for his fantastic beliefs.” After Isaac (“whose name comes from the Hebrew word for laughing”) is born, Sarah’s response is not “comic laughter of superiority but a humbled grin.” Dauber discusses three main theories of comedy: incongruity theory (Sarah’s laughter is an example); relief theory, referring to jokes that relieve tension; and congruity theory, joy that “bespeaks divine harmony.” The author gleans insights from philosophers (Kierkegaard, Wittgenstein, Bakhtin), Freud, and many novelists (Bellow, Kafka, and Roth, to name a few). He analyzes Woody Allen’s “curmudgeonly neurotics” and the work of generations of comics, including Jack Benny, Danny Kaye, the Marx Brothers, Nichols and May, Mel Brooks, Gilda Radner, and Jerry Seinfeld. Male comics, he finds, “were happy to turn out stereotypical portraits” of Jews, while women invented a broader range of characters but still might include “the self-deprecating schlimazel” and the Jewish mother. A wide-ranging and insightful cultural analysis.